This article has also been published in the Society of Twentieth Century Wargamers Journal. In the late 1960’s, helicopters with anti-tank missiles started to be deployed, and a new tactic known as a “pop-up” was developed. The helicopter would hover behind cover, then climb just high enough to fire a missile, before dropping down behind cover again. Newer missiles such as the American TOW allowed the helicopter to perform such a manoeuvre quickly, limiting it’s exposure to enemy fire. By 1977, the Soviets had introduced the 9K114 Shturm missile (known to NATO as the AT-6 Spiral), which had a range of 5km. The U.S. army’s anti-aircraft systems at this time were the Vulcan, which had a maximum range of only 1,200 metres, and the Chaparral, which couldn’t lock on to the helicopter before it dropped back down behind cover. As if to add insult to injury, the Soviets introduced the ZSU-23-4 Shilka, which was able to engage U.S. helicopters performing pop-up manoeuvres, even while the U.S. army had nothing capable of doing the same. The ZSU-23-4 proved to be effective during 1973 Middle East War, and in 1974 the army concluded a “Gun Air Defense Effectiveness Study”. As a result of this, two companies were given development contracts, but no vehicles were put into production because the 25mm guns that they used had insufficient range and didn’t use NATO standard ammunition. The U.S. army issued the “Advanced Radar-directed Gun Air Defense System” (ARGADS) requirement, which was later renamed “Divisional Air Defense” (DIVAD). Unusually, the requirement specified that the system was to use existing parts. This was done in an attempt to cut down on development time, since the problem was considered to be extremely serious and a solution was urgently required. It was believed that this approach would cut development time by anything up to five years. The requirement was for a vehicle based on an M48 tank chassis provided by the army (there were many spare M48s in depots which could be used for this purpose). It was to be armed with a gun of 30-40mm calibre, capable of engaging a target within 5 seconds of it coming into range, with a 50% chance of hitting the target with a 30 round burst. It was to have all-weather capability and an optical aiming system equipped with forward looking infra-red (FLIR) and a laser range finder. The five second engagement time was later relaxed to eight seconds. There were several entries for the competition. Sperry Rand’s entry used their Vigilante gun firing 35mm Oerlikon ammunition, as used by several other NATO countries. The gun was fed from a magazine holding 1,464 rounds and was mounted in an aluminium turret. Two radars and an IFF system were mounted on top of the turret. The entry from General Electric used the 30mm GAU-8 Avenger seven-barrel rotary cannon (the same cannon fitted to the A-10 Thunderbolt II aircraft). It had a single radar for both search and tracking, based on the AN/MPQ-49 Forward Area Alerting Radar. Raytheon entered a system using the turret from the German Gepard anti-aircraft tank. It retained the same twin 35mm Oerlikon KDA cannons as the Gepard, but had a Hollandse radar and an Oerlikon Contraves fire-control computer. 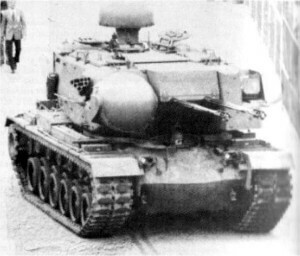 Despite being designed to be fitted to a Leopard I, Raytheon demonstrated that the turret could be fitted to an M48 with some modification. The General Dynamics entry used the same twin cannons as the Raytheon, but mounted them side by side in the middle of a new aluminium turret. 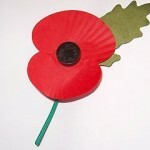 They were fed from 600 round magazines and could achieve a combined rate of fire of 1,100 rounds per minute. Radar and fire control were based on the systems used on the Phalanx ship-board CIWS (close-in weapons system). The search radar was mounted on top of the turret, with the tracking radar next to the guns. 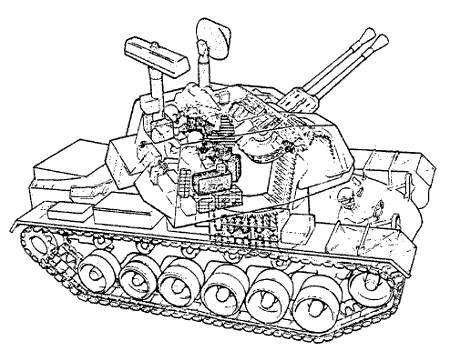 Ford Aerospace entered a system using two Bofors 40mm L/70 cannons, mounted in the middle of the turret. Two radars (one search, one tracking) were mounted on booms on top of the turret, allowing them to be folded down for travel. The tracking radar was based on the Westinghouse AN/APG-66 , as fitted to the F-16 fighter. The turret’s armour was proof against small arms fire and artillery splinters, and the vehicle had NBC protection for the crew. The choice of a 40mm gun in the Ford design was the subject of some controversy. Some maintained that Ford chose it because they had a marketing agreement with Bofors, and could therefore make more profit from Bofors guns. On the other hand, FACC had developed a 40mm round with a proximity fuse, and the larger round meant a greater quantity of high explosive. These both led to a higher probability of a kill. In early 1978, General Dynamics and Ford were given $79 million contracts to produce prototypes, designated the XM246 and XM247 respectively. In 1980, each company delivered two prototypes for testing at Fort Bliss. The tests lasted five months, and it was said that the General Dynamics vehicle had out performed the Ford vehicle consistently in the tests, but the Ford was controversially chosen as the winner in 1981 (there were accusations that the Ford was only chosen due to intense lobbying). Ford were given a fixed-price contract for the completion of development and the initial production run. The vehicle was officially designated the M247 Sergeant York. The contract included an option for the army to buy up to 276 vehicles over three years, and it was expected that the army would buy a total of 618 vehicles. The M247 was very advanced. The fire-control system automatically handled all aspects of evaluating threats, selecting ammunition and aiming, taking into account target speed and environmental factors. Manual overrides were included for all automatic systems. The operator’s display showed the targets in priority order, and the operator simply had to select which one should be targeted. Problems became apparent almost immediately, particularly with the tracking radar. It had difficulty differentiating between helicopters and trees, and when the guns were trained to a high degree of elevation, the barrels caused more difficulties for the radar. The specification had originally called for an engagement time of five seconds, and although this was increased to eight seconds, the system still failed to meet this requirement. Against helicopters it only managed 10-11 seconds, and against high-speed targets the engagement time was 11-19 seconds. As testing went on, more problems became apparent. The electronic counter-counter measures suite was simplistic and easily foiled, the turret suffered from hydraulic leaks in cold weather and couldn’t turn quickly enough to track a fast moving target. The guns were taken from U.S. Army stock and were found to have been stored badly. Finally, the vehicle was too slow to keep pace with the new M1 Abrams and M2/M3 Bradley, which it was intended to protect on the battlefield. In a demonstration for officers and VIPs, the system locked onto the viewing stands, causing something of a minor panic as the observers dived for cover. The technicians made several attempts to solve the problems, but the test system didn’t manage to engage any targets. A Ford manager claimed the problems were due to the vehicle having been washed for the demonstration, and that this had affected the electronics, causing a journalist to wonder sarcastically if it ever rained in Central Europe. Problems continued to be evident as production started, one vehicle famously locking onto a latrine fan, mistaking it for a moving target. The M247 was getting a lot of bad press and was unpopular in Washington, but the army pushed for it to be deployed, since there were no viable alternatives available. However, the Soviet Union was starting to deploy new, longer-ranged anti-tank missiles, which would allow their helicopters to stay at a range where the M247 would be much less effective. The army suggested that Stinger surface-to-air missiles could be fitted to the M247 to counter this problem, but this simply fuelled complaints that the system was a waste of money. Caspar Weinberger, the Secretary of Defense, ordered a series of battlefield condition tests, monitored by the new Operational Test and Evaluation Office (OT&E), which were carried out in late 1984. The M247 did not perform well. Tests were continually relaxed – when the system failed to hit targets flying in a straight line, the targets hovered. When the radar couldn’t lock on to the target, radar reflectors were added. Four reflectors were added before the radar was able to lock onto the target. The OT&E concluded that the M247 did meet the requirements specified, but it had severe reliability issues. The OT&E reported that “As tested, the Sergeant York was not operationally effective in adequately protecting friendly forces during simulated combat, even though its inherent capabilities provided improvement over the current Vulcan gun system. The Sergeant York was not operationally suitable because of its low availability during the tests.” The requirement was for 90% availability, but the OT&E found it had an availability of only 33%. The program was cancelled in August 1985, after 50 vehicles had been built. Announcing the decision, Caspar Weinberger noted that “A decision to cancel what is basically an ineffective system doesn’t eliminate the need”, and so the army started to look for another system to fulfil the requirement. They eventually settled on the M6 Linebacker, an M2 Bradley with Stinger missile launchers.